Leadership lessons from a hero. 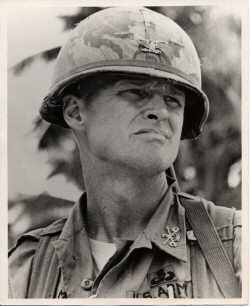 Lt. General Hal Moore is one of the greatest officers in American miltary history. He lead a valiant group of men responsible for rebuking an attack by a large force of North Vietnamese soldiers. The Vietnamese greatly outnumbered his men but they fought bravely and overcame significant odds to prevail. The story of his and his unit's bravery was told in the movie "We Were Soldiers" and the book from which it was based. Lt. General Moore exhibits exactly what a leader should be. After his military career he shared his 17 leadership tenets which are listed below. Please read them and try to live by them. Stay smart, competent and aggressive. Three strikes and you’re not out! There is always one more thing you can do to influence any situation in your favor. A leader must be visible and exhibit confidence under any set of circumstances. The determination to prevail must be felt by all. A leader must always be ready! When there is nothing going wrong, there’s nothing going wrong except there is nothing going wrong. Trust your instincts. Instincts and intuition give you an immediate estimation of a situation. Everything in leadership boils down to judgment. Intelligence and good character does not imply you have good judgment. Study history and leadership qualities. Pay special attention to why leaders fail. A person in a position of authority does not automatically become immediately respected or trusted. This is earned. Every person in an organization is as important and necessary to a mission as the next person. That goes from the top to the bottom. Instill the will to win. There can be no second-place trophies on display—awarded or accepted. Never deprive a person of their self-respect. NEVER! To do well in any field of endeavor, it is an advantage to work with good people. Strive to have one or two people around you who are totally trustworthy. Spend quality time with the team, learning who they are and what motivates them. Create a family. Great leaders learn to lead self first. Before you can lead others, leading self successfully must be accomplished day in and day out. Successful leaders create the future. Leaders must lead. Be the first boots on the ground and the last boots off.